Jean Darnell: Awaken Librarian! 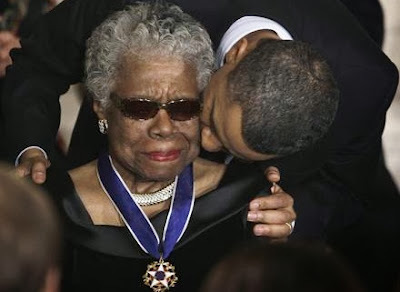 : Maya Angelou: A Woman as President Interview! Maya Angelou: A Woman as President Interview! Yes, I do ADORE Dr. Maya Angelou as a poet, writer, director, performer, soul sister and the "Grandmother I always wanted!" I saw her at the Houston Hobby Center in 2009 and that experience catapulted me to grab the reins of my life and start going and growing in the direction of my dreams! Now, she's done it again. Please read this article from Huffington Post. Not only does it discuss a woman being president--which will only succeed when both the House and Senate are more gender diverse...one person can start the change, but the TEAM has to work together--but this article also enlightens the audience on the true value of character: COURAGE!